Mediterranean style cruise line MSC Cruises recently celebrated the launch of it's first Vista Class cruise ship, MSC Meraviglia. The ship is the largest to be built by a European based cruise line and comes built with many innovative features and exciting highlights, including MSC for Me onboard technology and an exclusive partnership with Cirque Du Soleil. Sailing the Mediterranean from 2017, MSC Meraviglia transports guests to popular ports such as Barcelona, Naples, Genoa and Sicily. There is plenty to do onboard during sea days with entertainment ranging from live ariel performances to augmented reality experiences. Vista Class smart technology includes a 262 ft LED dome providing impressive light shows, passenger smart NFC wristbands and even a TV studio with a radio broadcasting suite onboard. Planet Cruise have been lucky enough to follow MSC Meraviglia's process from construction to christening and captured a few action shots of MSC Meraviglia in the making. See the processes and operations involved with constructing a Vista Class cruise ship from bow to stern. The team joined in the celebrations for MSC Meraviglia’s christening on June 3rd in La Havre and took the opportunity to explore the new MSC Cruises flagship. First impressions were exceeded and we were wowed by the new Vista Class smart features onboard. Secure your spot for MSC Meraviglia's maiden season and be a part of cruising history. 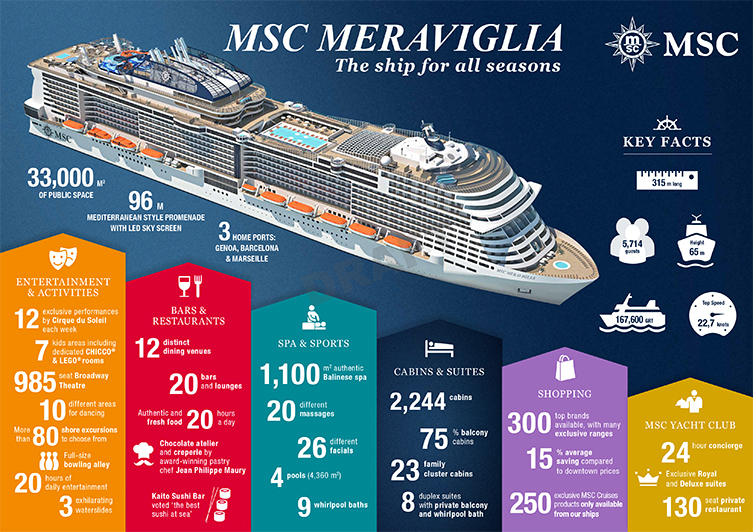 See our MSC Meraviglia cruise deals.